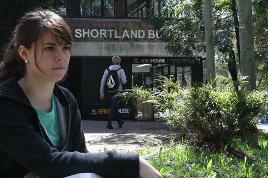 Dr Erin Campbell's doctoral thesis studied stress and addiction neurobiology. The purpose of my Travel Grant was to travel to the National Institute on Drug Abuse (NIDA) in Baltimore, USA, to learn novel preclinical techniques in behavioural neuroscience such as chemogenetics. This grant enabled me to spend 8 months in Baltimore studying addiction neuroscience at the National Institute on Drug Abuse (NIDA). There, I was exposed to many new behavioural techniques which we had not yet been established in Newcastle including chemogenetics and optogenetics (using designer receptors/drugs and light to control neuronal function). This grant also allowed me to travel to international conferences including the Gordon Research Conference in Maine, USA, and the Society of Neuroscience Conference in Chicago, USA. Short term benefits of the grant included learning novel neuroscience techniques in USA in order to establish them in our labs in Newcastle. Long term benefits of the grant included postdoctoral opportunities both within Australia and internationally. This grant has also set me up with life long international collaborators. This travel grant provided by Jennie Thomas allows PhD students the amazing opportunity to travel and work with experts in their field both nationally and internationally. 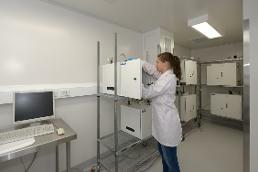 Such grants will ensure Newcastle stays at the forefront with research techniques and international collaborations. My collaborations established in the USA (made with the help of the Jennie Thomas Travel Grant) have allowed me to obtain postdoctoral research work at the Florey Institute of Neuroscience and Mental Health in Melbourne. 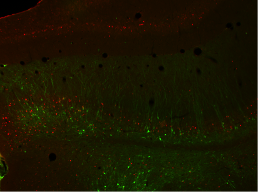 "KORD in the ventral subiculum"
Illustrates expression of the inhibitory kappa opiod receptor based DREADD (Designer Receptor Exclusively Activated by Designer Drugs) in ventral subiculum to nucleus accumbent shell projection neurons.